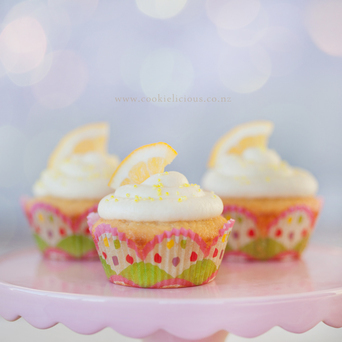 This recipe is very simple to make and it will make delicious lemon cupcakes. They are really moist, fluffy and light...they will melt in your mouth. Makes approximately 24 medium size cupcakes. Sift the self-rising flour in a bowl and set aside. In another bowl, beat the butter and sugar in a mixer until light and fluffy. Beat in the eggs one at a time, beating each egg until incorporated before adding the next. Gently beat the flour into the butter mixture, one third at a time, alternating with half the milk and half the lemon juice after each of the first 2 additions of flour. Beat until just combined (Note: take care not to over mix). Bake in the preheated oven until a skewer inserted in the center comes out clean, approximately 15-17 minutes. (Note: each oven is different, so i would recommend getting to know your oven and adjust accordingly. You will know the cupcakes are done when you test with a skewer and it comes out clean. Ice them with lemon whipped cream icing (recipe below). Beat the cream in a chilled bowl with an electric mixer set on Low until the cream begins to thicken. Add the icing sugar and lemon juice, a little at a time, beating after each addition, until fully incorporated. Increase the mixer speed to High, and beat until the icing forms soft peaks, about 5 minutes.